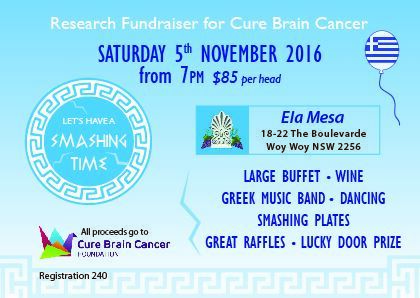 Have a great night out and enjoy delicious Greek specialties, wine, Greek Dancing and break a plate or two at Ela Meza Greek Restaurant at Woy Woy. All money raised goes to Brain Cancer Research. There are lots of Lucky Door prizes and raffles.